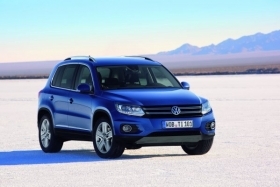 VW's two SUVs sold in the United States have a more than $20,000 gap in pricing, with the smaller Tiguan, pictured, starting at $22,840 and the Touareg beginning at $43,375. DETROIT (Bloomberg) -- Volkswagen plans to add a mid-sized SUV to its U.S. lineup, the CEO of its unit in the country said. "There's a great opportunity for us for a mid-size SUV in the U.S." that would be positioned between the smaller Tiguan and larger Touareg SUVs, Volkswagen of America CEO Jonathan Browning told reporters at an Automotive Press Association event in Detroit on Wednesday. He declined to say when the company may introduce the model or whether it was in development. A mid-sized SUV would help complete Volkswagen's "core portfolio" in the United States, Browning said. The automaker is counting on revamped versions of its Passat, Beetle and Jetta cars that have been introduced since 2010 to reach U.S. sales of more than 500,000 vehicles this year. Volkswagen's two SUVs sold in the United States have a more than $20,000 gap in pricing, with the smaller Tiguan starting at $22,840 and the Touareg beginning at $43,375, according to Volkswagen's Web site. The company opened a $1 billion factory one year ago in Chattanooga, Tennessee, to build 150,000 Passat sedans a year. The Chattanooga plant is adding 1,000 workers this year to meet demand for the Passat, boosting annual production capacity to more than 170,000 units, Browning said. The factory could expand to produce more than 250,000 vehicles annually with additional investment, Browning said. The company hasn't decided whether to proceed with such an investment, he said.